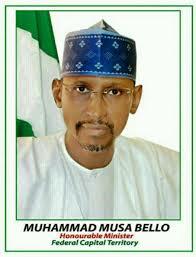 Minister of the Federal Capital Territory (FCT), Malam Muhammad Musa Bello has announced the release of the sum of N76.5 million being the counterpart fund for the execution of various projects in the Territory by Japanese government. It was a grant to Nigeria, through the Japan International Cooperation Agency (JICA). The Minister, who spoke today when he recieved a delegation of JICA in Nigeria led by its Country Senior, said that N46.5 million out of the N76.5 million is counterpart funding for integrated solid waste management system in the Federal Capital Territory under the Abuja Environmental Protection Board (AEPB). reduce water leakages on the main trunk line. The Minister stressed the importance of the Abuja city to have a comprehensive waste management system for the benefits of all residents. He said that the FCTA is working to expand access to the dumpsites and also create more access roads into the sites so that the refuse disposal trucks can go in simultaneously from three different entry points. According to him, this will ensure that waste is properly disposed at the dumpsites. He lamented that the absence of enough entering points to site has made some trucks to dispose wastes on the site indiscriminately. The Minister stressed the need for waste to be properly sorted in the Federal Capital Territory for recycling and other purposes, thereby improving their economic values, saying that waste is wealth. Musa Bello expressed the desire of the FCT Administration to also partner with JICA on waste management in the FCT Area Councils and satellite towns; saying it would serve as blueprint for practical waste management system in the entire Territory. The Minister thanked JICA for the solar powered project it is carrying out at the Lower Usuma Dam water treatment plants; stressing that it is a big relief to the Administration. Speaking earlier, the JICA Country Senior Representative, Mr. Hiroshi Kodama noted that JICA has several knowledge and skills, particularly in the area of agriculture that it is willing to share with the people of the FCT. Mr. Kodama recalled that last year, JICA organized a workshop in Gwagwalada on rice cultivation technology especially on improved parboiling technology aimed at improving the quality of rice production in the Territory.